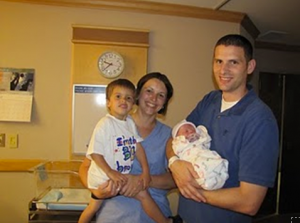 My story began almost 4 years ago with the birth of my husband's and my first son, Aidan, born September 2007. 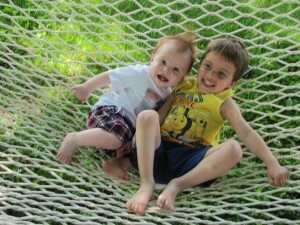 Mayo Clinic became involved with my story when they delivered our second son in July 2010. This beautiful child, Liam, was born almost 2 years after learning I would never carry another pregnancy and had only gestational surrogacy as an option to complete our genetic family. After reaching out to family and friends with my story, I found an angel in my friend from childhood, Jessica Flotterud, who agreed to become our gestational surrogate. Jessica has two children of her own with her husband and since working at Mayo Clinic as an OB nurse, has seen first hand the struggles some families have to get to the point of having their genetic child. She and her husband told us that they knew if they were in the same situation, they would have the same needs we did. The process of surrogacy was much more complex than any of us realized, but once it began, we all jumped in and supported each other through the entire process. As soon as our little embryo was implanted, Jes became our angel, caring for this miracle like it was one of her own. After months of anticipation, daily emails, weekly phone calls, pictures, letters, and lots of hope and prayer, we arrived at St. Mary’s Hospital to wait for our baby to be born. On July 28th, 2010, we arrived to sit with Jes, her close friend, and paced the halls while she labored with our child. We were in awe of the support Jes received from her nurse, Steph, her midwife, Sue, and other supportive staff. Steph barely left Jes’ side during her labor, and provided exactly what was needed. When it was time for baby to deliver, I was able to be right at Jes’ side, helping, feeling overcome with emotion. As he was born, her midwife Sue placed him right into my arms for the most amazing experience I’ve ever had. With his birth, my husband Dan, son Aidan, and I found more completeness to our lives than we had before. I just could not explain the amazing care we received from Mayo. Not only with our son Liam’s’ delivery and birth, but our visits with Jes to her prenatal care, social work assistance we were provided, and our inpatient stay with Liam after he was born. We were never treated like anything but Liam’s parents and were cared for just as well, if not better, than we were when I delivered our first son. Liam just had his first birthday, and I know on that day, like I did this year, I will always remember our experience the day he was born. Our story will always include the staff who cared for us at Mayo, our dear friend, who herself works at Mayo, and our amazing family and friends. Thank you all for our wonderful care and helping us have a beautiful little boy!